This article is a short summary of Mario Party 6. 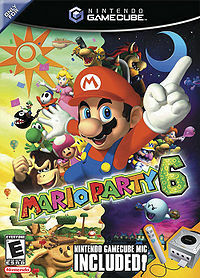 Mario Party 6 is the sixth title in the Mario Party sub-series made for the Nintendo GameCube and the third installment for that console. It was developed by Hudson Soft and published by Nintendo. The game was packaged with a microphone, which is used to play voice-controlled mini-games in a new mode called Speak Up. This page was last edited on 8 September 2017, at 01:40.